Rainbow Fluorite tumbled stones in mixed sizes of small to medium stones. These Fluorite stones range from icy pale green colors with good clarity to delicate shades of purple, blue and a milky translucent. Fluorite is an excellent aide to understand the intrinsic balance necessary for good relationships. 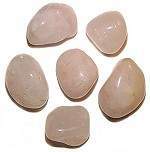 Brazilian Rose Quartz tumbled stones in mixed sizes of medium to large stones. Called the Lover's Stone, Rose Quartz can be used to radiate the soothing love energies in your home or office. 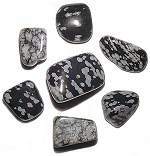 Hematite tumbled stones in mixed sizes of medium to large stones. Hematite has been considered a "Stone of the Mind", enhancing mental attunement and original thinking, it is mysteriously heavy and has the appearance of a polished silver mirror. Translucent Pale Jade or Jadeite (also called New Jade) tumbled stones in 3/4" -1" medium size stones. The Mayan Culture viewed Jade as the "Sovereign of Harmony". 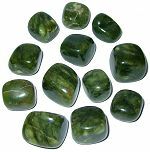 In crystal lore Jade helps one to attune to the needs of others and inspires wisdom during the assessment of problems. Fancy Jasper tumbled stones in mixed sizes of 3/4" small to 1 1/4" medium stones. These spectacular Fancy Jasper stones are bursting with fantastic colors and patterns that only Nature can conceive. Jasper has been a sacred stone for kings and shamans, believed to ward off negativity and give protection. The colors vary widely from light to dark shades. Red Jasper tumbled stones in mixed sizes of 3/4" small to 1 1/4" medium stones. Jasper is said to be a stone of justice, assisting to rectify unjust circumstances. It is also thought to be protective. Leopardskin Jasper tumbled stones in mixed sizes of medium to large stones. Jasper is an opaque form of Chalcedony and has been a stone for kings and shamans. Buddha in many incarnations, sought truth, peace and enlightenment, encouraging tolerance and spiritual growth. Beautiful Brazil Lavender Lepidolite tumbled stones in medium size, have Mica crystal highlights that catch the light. Lepidolite is an unusual Mica silicate with heavy Lithium deposits that create the purple and violet hues. It is said to have a refreshing energy of lightness, hope and acceptance. Indian Moonstone tumbled stones in mixed sizes of small to medium stones. These Moonstone stones range from peach to blue hues with a translucent sparkling sheen and opalescence. Moonstone is part of the feldspar group like Labradorite. 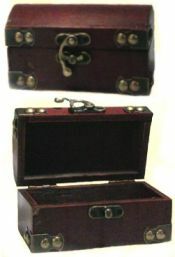 The finish is very smooth with high polish. Moonstone is a stone of new beginnings, it illuminates the inner self and strengthens intuition and the subconscious dream world. Black Onyx tumbled stones in mixed sizes of small to medium stones. The power stone Black Onyx has been used to banish grief and encourage happiness and good fortune. Mexican Snowflake Obsidian tumbled stones in mixed sizes of medium to large stones. Obsidian takes on Snowflakes when a white mineral Phenocryst is present. It is a stone of purity, bringing balance to body, mind and soul. Peru Rhodonite tumbled stones in mixed sizes of 3/4" small to 1 1/4" medium stones. Rhodonite has a color range of pink to purple hues. 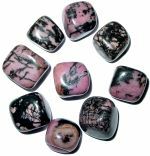 These Peru Rhodonite Worry Stones include dendritic manganese oxide crystals which create unique, artistic black veining. It is said to balance the yin-yang energies and assist in the attainment of one's greatest potential. High quality Peru Serpentine tumbled stones in mixed sizes of 1/2" small to 1" medium stones. Green Serpentine is also known as Bowenite and has variegated deep green hues. This is an excellent meditation stone and is said to clear the chakras allowing Kundalini energies to flow. Brazilian Sodalite tumbled stones in mixed sizes of medium to large stones. Sodalite promotes companionship and self-esteem. Deep blue Sodalite is rare and very beautiful. Similar to Lapis Lazuli, it is often used as cabochons in jewelry. 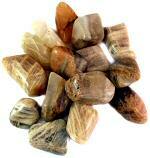 High quality South African Gold Tiger Eye tumbled stones in mixed sizes of 3/4" small to 1 1/4" medium stones. Polished Tiger Eye is a joy to look at with it's rich chatoyancy and deep reflective colors. Tiger Eye exudes assertiveness and drive. It magnifies personal energies of desire, enthusiasm, vigor and action. 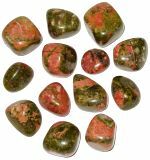 Unakite tumbled stones in mixed sizes of 1/2" small to 1" medium stones. Unakite is a crystallized form of pink Feldspar, green Epidote and Quartz. It is believed to clear blockages to physical and personal growth and and enhance focus on goals.